Confessions of a neurotic immigrant housewife: Bell... Isn't she lovely? There are very few designers that I trust completely. 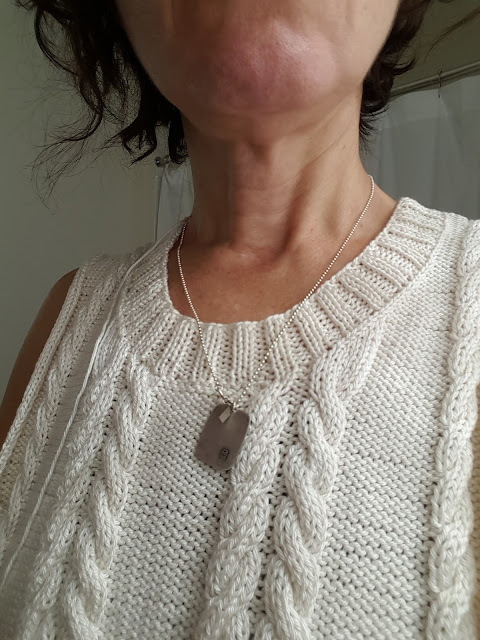 In a knitter sense of trusting, of course! It means that this particular designer poured hours of deliberations and checking into her work and that I, a humble knitter, don't have to recheck and review her pattern before actually making it. Ann McCauley is this kind of designer. When Bell was first published, I immediately decided to make it sooner or later: it looks classy and elegant, could be dressed up or down, is obviously very flattering for a woman's body. I had one concern: I really wanted to wear this one, not to put it in my closet waiting for the "sweater weather" that might never come for me. Since we became "snowbirds" I've been living in almost perpetual summer which is a little bit frightening because I have almost no opportunities to wear my wonderful wooly sweaters. My solution was to find some summery and cottony yarn for this sweater, preferably in white. I dived into my stash and found some promising yarns but... in the pattern's descriptions it says that Bell requires 1435 yards for the smallest size, and I wanted to make it a little bit roomier, with more positive ease, therefore, I needed even more yards and I didn't have them in my stash. At home I made a swatch and my row gauge was a little bit different from the pattern but I liked how it looked and felt, and I had 6 balls of this yarn already. The back was started soon afterwards but then postponed because my Dream cardigan needed all my attention and then we left for England. We had only a week in Pennsylvania before leaving again - for Florida. I spent that week finishing the cardigan of my dreams and wore it proudly on the plane. The only project on my needles at the time was Bell and it went to Florida with me with little hope of much knitting because we were supposed to be very busy there. It turned out a lot of stuff got canceled because of the hurricane (see details here) and I had to spend many hours just waiting: for our departure day, for our flight, for the hurricane to finally hit, and for the news of how things were in the aftermath. During all this let's say trying time I was making Bell. It was more or less brainless knitting (rather more than less), just to keep myself going, just to do something. I picked the second size and... worked and worked without giving it much thought, almost mechanically going through the motions. It was easy with Bell. It is well written and you don't have to anticipate problems, the designer had already done it for you. The only complication was the pattern's layout. It took so many pages (I printed it out because sometimes you don't have the Internet but still want to knit, you know)! I really prefer when the chart and its legend are on the same page, don't you? Or when you don't have to go back and forth constantly looking for an explanation of a technique. Yet, this is not designer's fault, and a lot of publishing companies are doing it because, well, they went paperless, they don't have to actually print their patterns, so no need to save space. The one thing that I inadvertently changed in the pattern was the way of decreasing - I made all decreases on the wrong side (knit rows). When I noticed my mistake I was almost done with the back so I decided to keep it this way throughout with the one exception - the neckline. And I especially like the neckline on this garment! This neckline was done the way the designer meant it to be done. No changes at all. It was hard to photograph Bell well - not only it is almost white, it has a little bit of shine that combined with the sunlight makes pictures blurry. Plus my photographer/husband was even busier than usual lately and not really willing to take any pictures. The ones that I used on my Ravelry page and here were taken in a hurry one evening when the sun was almost out and we both were exhausted. Yes, I am making excuses because I am not fond of these pictures but they are the only ones of this sweater that I have for the moment. After I put them on my Ravelry page Ann McCauley contacted me (blushing!). She liked the fit and the end result but was concerned about the yarn. She had used the Cascade Ultra Pima for another project several years ago when the yarn first came out and after a couple of wearings it looked fuzzy and had small pills. I do hope that Bell will look as lovely in a year from now but I don't know how this yarn will wear. I promised Ann to take pictures of it in a year and send them to her. Let's wait and see. I'll post them here as well. By the way, I used only 4,5 balls of yarn = around 1000 yards. Keep it in mind if you decide to make Bell. Meanwhile, for the first time in my life I performed a surgery on my knitting. There are many rewards when you decide to keep yourself exceptionally busy. For example, my house is very clean now, and I got rid of a lot of stuff that I don't need anymore. And I fixed some of my old knits that were discovered in my closet and deemed to be worth of wearing. This top was eaten by moth before I even had a chance to wear it. It had a big hole right at the bottom front. The pattern was from Rebecca knitting magazine that was popular (and translated to English) at the time and many people were making it (this is the only explanation that I could come up with for why I made it in the first place - ruffles are not my style, plus it is made out of wool but without sleeves, so no idea where and how to wear it). 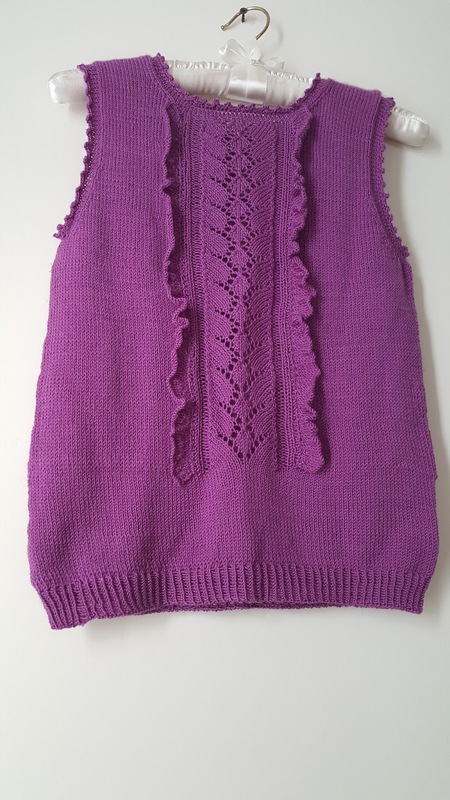 Anyhow, surgery of a knitted garment has been on my bucket list for a while now. It turned out to be much easier than I thought. After all, moth have already done most of the job. I just had to find the end of the yarn thread and unravel it. Picking up stitches of a finished, washed, and blocked garment was easy. And I used ribbing instead of the original crochet finish and Kitchener cast off that I've been using a lot lately. I like how it looks now. Ruffles are fashionable again, so maybe I can wear it one day. And I overcame my fear of knitting surgery - YAY!!!! Thanks for another enjoyable read. I appreciate your honesty and wry humor about buying more yarn than necessary. I'm also curious about the neckline decreases for Bell. The neckline looks quite wonderful in your photograph. Sorry about the near-constant good weather you must endure. That's why living in northeast Ohio is so great - crummy and cold winters make for lots of knitting time and are perfect for wearing wool! The neckline decreases are done knitting two sts together on the purl row which looked a little bit weird at the time. Yet, when all parts were finished, blocked, and sewn together, and especially after I picked up all neckline stitches, it made much more sense. 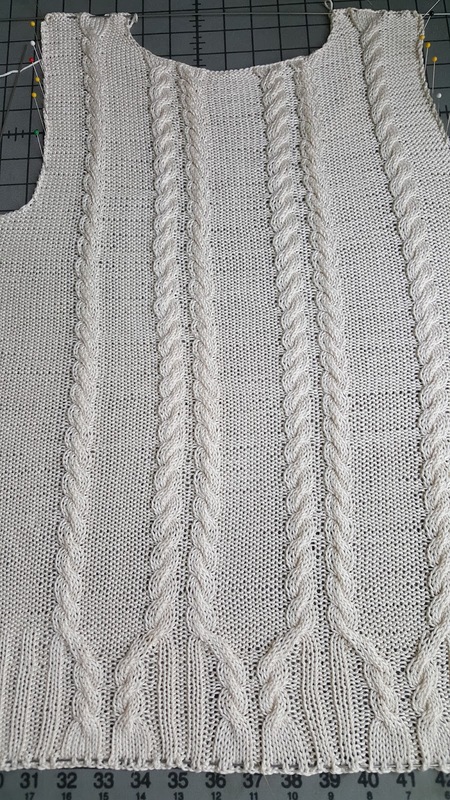 By the way, I picked the exact amount of stitches for the neckline that is required in the pattern - all math is WEIRDLY accurate in this pattern (usually, it doesn't happen, at least, not with me). And thank you, Janet, for reading all my ramblings - it means a lot to know that someone there, in Ohio, is listening, and commiserating, or maybe laughing. As to the ordeal of near-constant good weather - yes, guilty as charged, shouldn't complain. But tempted nevertheless... I love working with wool!